“Conservation of the inherently ephemeral: LMU chemists have developed a simple way of digitally documenting the genuine tonal values of dyes and pigments used in artworks, thus allowing their original colors to be restored. “The Keep” is the title of an installation created by the American artist Mike Kelley (1954- 2012), which is now part of the collection assembled by the Brandhorst Museum in Munich. Roughly hewn planks are nailed together to form what looks at first sight like a garden shed. The interior is visible through peepholes in the walls, and the viewer can discern a bench with circular slots cut in it, reminiscent of an old-fashioned latrine – an impression is further strengthened by the inclusion of a few comics and condoms. 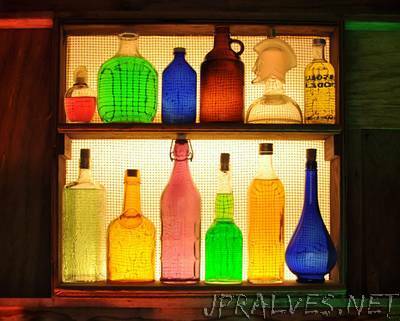 In the background, lit up like a house-bar, is an array of bottles and glasses filled with brightly colored liquids. It was, and is regarded as the one of the key works in the artist’s oeuvre. Kelley first made a name for himself as a musician in the noise and underground scene, but with “The Keep” he succeeded in combining apparently harmless and thoughtlessly discarded objects to produce an impression of menace, evoking the melancholy and the dangers that lurk in our everyday lives. How does one go about conserving such an artwork? And how does one decide at what point, and in what state, it needs to be conserved? Art technician Helena Ernst chose to tackle these questions in her M.Sc. thesis at the Technical University of Munich – and she turned to Heinz Langhals, Professor of Organic and Macromolecular Chemistry at LMU, for expert advice.